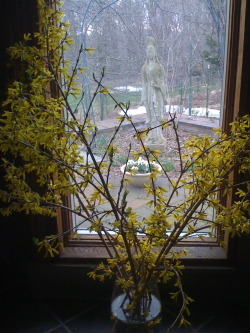 Spending Holy Week at the farm was intense, gratifying, and challenging. I continue to be humbled by how unfamiliar I am with Christian practices and traditions--a feeling especially uncomfortable since, as I near 40, I realize that I haven't truly been a novice at anything for quite some time. In academia and in my work as a program director, I quickly found my footing. Here, I stumble, get up and dust myself off, and then soon stumble again. One of my new favorite sentences: "I don't know what that is." Another: "What does that mean?" And: "Can you explain it to me?" This week, I smelled nard for the first time--nard is a fragrant and precious oil that was used by a woman identified as Mary, perhaps Mary Magdalene, to anoint Jesus, in preparation and recognition of his impending death. And I participated in Tenebrae, an ancient practice of plainsong prayer that takes place on the Wednesday, Thursday, and Friday of Holy Week, in the evenings. During Tenebrae, which means "darkness," the lights are progressively extinguished until the final songs and chants are performed in the dark. This week, I sang my first-ever solo, bursting into tears just after finishing, from the fullness of emotion carried by the music and from my overwhelming sense of imperfection. I learned about the restoration of the story of Mary Magdalene, commonly portrayed as a prostitute, who is now understood by scholars as a prominent disciple of Jesus, and not a "fallen woman." This Easter morning, I was awakened shortly after 4 am by the Vigilant, one of the sisters charged with waking all the others, with the words "Christ is risen," to which we responded "And has appeared unto Mary Magdalene." Throughout this week, I've struggled to make peace with some of the common strands, and language, of the passion of Jesus that I find troublesome, to find ways to reconcile the parts that don't ring true to me. And when I haven't been able to find peace, I've struggled against my impulse to just flee the scene, to run away, to reject it all, as I did (at least emotionally) when I was 15. To top it off, there's been the almost daily revelations of the extent of the clergy abuse cover-up within the Catholic Church, and the Vatican's astonishing unwillingness to claim full responsibility and work towards healing. The extent to which this institution has isolated itself, and moved so far away from the work and message of Jesus, is baffling, and infuriating. Like I said, it's been an intense week. There's a lot for me to digest. I continue to take comfort in physical activity. We've been doing a lot of planting, and carrying plants in and out of the greenhouse to "harden off." I've been removing mulch, raking up old leaves, digging holes, carrying watering cans. My arms and legs and back are awakening, murmuring to me, "oh yeah, I remember this . . ." On Holy Saturday, we worked in silence, planting 150 plants (cabbage, broccoli, broccoli raab, tat soi, bok choi, and kale). My arms and legs trembling at the end of it all. But my mind clear, at peace. Working hard brings me into the present moment, shushes my mind from its tendency to argue, litigate, prosecute. When you're nurturing these little plants, you have to focus, and be careful. They're delicate, and one unthinking move can squash and bruise a leaf, or even rip it right off. They can be underwatered, overwatered, get too much sun. Planting them into the soil is a bit traumatic for them, and for me . . . 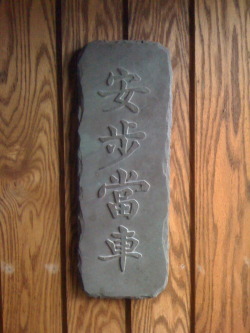 The sisters have a plaque on the entrance to chapel, a Zen proverb in Chinese characters, that reads "Chop wood, carry water" (pictured left). The full saying is: "Before enlightenment, chop wood, carry water. After enlightenment, chop wood, carry water." The idea is that doing a task with full awareness, practicing being in the world with loving-kindness, will help one reach enlightenment, that the chattering, thinking mind can be quieted through repetitive, awareness-filled work. It's certainly been my experience that I can quiet all those jumping monkeys in my mind by getting into the work of the farm, by letting go of my compulsive overthinking, by letting go of my pride and awkwardness about being a novice, by letting go of my anger toward the incredibly flawed institutional church. I believe that my spiritual practices--whether planting or singing or praying--are supporting my journey toward light, openness, and forgiveness. I just have to keep chopping wood, carrying water. It's sure better than walking around with my soul all boxed in, seething. I've mentioned that Easter has long been my favorite holiday, that I've relished the opportunity for new beginnings. I see that this year is not so much a new beginning, but a return. I see that my spiritual development was largely halted around age 15, when I became overcome by anger at the church. I was bitter about what I perceived as the church's straying from the gospel. I was repelled by its seeming infatuation with itself as displayed through the finery, the gold, all the embellishments and pomp. I was outraged by the apparent disengagement of many of the adults around me, who seemed to just mouth the words, impatient to leave right after communion, cutting each other off in the parking lot. And I was stung by the hierarchy and its insistence on the subordination of women. All this "stuff" is still with me. I've still got to deal with it. And so this Easter season is less like the ones past, where I felt inspired to turn the page, start over, rise up again. This time, I'm just here, accompanied by my 15 year old self. So we're going to chop wood, and carry water. What else is there to do?